The Town Hub: Stopping off at the Merchants and Drovers Tavern ~ The History Girl! Before the advent of the automobile, the trip between New York and Philadelphia was usually a two-day journey via stagecoach. The road conditions varied and the weather was often an important factor in travel time. Along the road between the two major cities, numerous taverns were built, offering weary travelers, their drivers, and horses a bit of respite. Food, drink, rest, and entertainment were plentiful in New Jersey taverns, which served as multi-faceted community centers. The Merchants and Drovers Tavern in Rahway, New Jersey was no exception, and faithfully served the community continuously for 130 years. Over 200 years later, the tavern, now restored as a museum, is a gathering place for community members, history enthusiasts, and school children yearning to understand the role of this four-story building at the busy crossroads of St. George's (Route 27) and Westfield Avenues. About 1795, a two-story commercial building was constructed next to Rahway Cemetery by Oliver Pierson. Oliver Pierson operated a small shop in the building. The property was purchased by John Anderson in 1798. That same year, Anderson successfully applied to the State of New Jersey for a license to operate a tavern in Rahway. Shortly after acquiring the building, Anderson began a series of improvements to the building. Structural evidence indicates that the building was extended about eleven feet to the north. The floor plan was altered and the staircase was moved further away from the front entrance. Shortly after the American Revolution, regular stagecoach travel between the cities of New York and Philadelphia was commonplace in a time before railroads and canals. Many would travel to and from these cities, looking for respite in between. The shortest route between New York to Philadelphia was by ferry to Jersey City, and then by stagecoach through Newark, Elizabeth, Rahway, Woodbridge, New Brunswick, Princeton, and Trenton. Once in Trenton, ferries carried passengers to Pennsylvania where stagecoaches continued the journey south to Philadelphia. The roadway was known as the King’s Highway and to locals as the Country Road to Elizabethtown. The Merchants and Drovers Tavern, 2013. It appears that the tavern in Rahway was successful. A small house was added to the rear of the main block of the tavern building shortly before 1820 to serve as a kitchen wing. As the need for more overnight accommodations increased, the building expanded once again. In the 1820s, the third and fourth floors were added. Historians believe Dr. David Craig authorized the work, as he acquired the tavern from the Anderson estate in 1822. The additional floors created a four-story, five bay federal style structure with a cedar shake gambrel roof. Four dormer windows were added to the roof. This tavern, like many others in New Jersey, served a multitude of functions, including education, entertainment, and other organized activities. Many of these events utilized the "large room," usually located on the second floor of a tavern. The "large room" at Rahway spanned the entire length of the building. Scientific experiments, magic demonstrations, animal acts, displays of curiosities, puppet shows, lectures and musical performances were among the offerings at this and other area taverns. In 1811, Mr. Morrison held a lecture in the large room of an Elizabeth tavern on "the advantages of a scientific education." 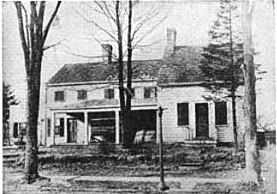 The Merchant and Drovers Tavern was utilized for a number of meetings, including one in 1804, to discuss the organization of Rahway Township. For several years, men of the town met at the tavern to plan the annual Fourth of July celebration. The tavern was also used to host sheriff’s sales, business transactions, dental services, stud service and other commercial ventures. Barroom at the Merchants and Drovers Tavern. Visitors to the tavern in the nineteenth century would have been served alcohol, stored in and dispensed from the bar. In early taverns, the bar was merely a table. By the late eighteenth century, however, cage bars became a common feature in taverns. The design allowed the liquor and spirits to be secured behind the wooden bars, away from the prying hands of "sleepwalking patrons" after hours. As sites evolved and tastes changed, these smaller caged bars were removed. Most of the cage bars seen today are reproductions based on paintings or drawings and architectural evidence. The cage bar at the Merchant and Drovers Tavern is a reproduction in size and shape, guided by marks on the floor and wall, where the original had been located. Overnight accommodations at taverns varied. Often, the bedrooms were sparsely decorated and often only contained beds, washstand, and a mirror. It was not uncommon for tavern owner to rent the room, and even the bed, to multiple guests. This practice began to fall out of favor by the 1820s, as tastes changed and patrons began requesting private rooms or rooms for families. Typical bedchambers at the Merchants and Drovers Tavern. In the early 1930s, a descendant of John and Catherine Anderson and Dr. Craig, made a few changes to the building, including the removal of a Victorian-era wraparound porch and modernization of the large second floor meeting room. The building served as a tavern until the mid-1930s when it ceased operations. For the first time in over 130 years, the site no longer catered to weary travelers. The rise of the automobile, improved highways, and roadside motels contributed to the decline and popularity of taverns. In the mid-1930s, the owner, a descendant of Dr. Craig, donated the use of the site to the local Girl Scouts. The Girl Scouts used the building as a headquarters for many years and the site was referred to by local residents as the "Girl Scout House." In 1971, the Rahway Historical Society, now the Merchants and Drovers Tavern Museum Association, purchased the building after holding a community-wide fundraiser. The building was in need of a major restoration that would take place in phases, as funding allowed. In 1976, the Society restored the taproom and in 1988 began exterior restoration and structural improvements. In 1999, the building underwent a full restoration of its interior, returning it to its circa 1820s appearance, new mechanical systems were installed, and the building was made ADA accessible. The foundation and exterior were also repaired. In early 2013, a new cedar shake roof was installed and future restoration of the exterior is planned for the future as funding permits. On the grounds of the Merchant and Drovers tavern is another tavern moved to the site in 1976. The Terrill Tavern was built circa 1735 by the Terrill family, one of the first European families to settle in the Rahway area. Abraham Terrill constructed a three bay, one-and-a-half-story home for his bride, Mary Dunham, a short distance south of the future location of the Merchants and Drovers Tavern. Mary and Abraham were married in the Westfield Church in 1763. A five bay, two-story wing was later added to the building to accommodate additional overnight guests. Tradition says Abraham's tavern was popular with the soldiers on both sides during the Revolutionary War. Terrill was a staunch patriot, but welcomed the British as a tactic of diplomacy. He served the British when they were in town, but as soon as they left, the inn became a recruiting station for the patriot cause. It is also local tradition that Generals Washington and Lafayette and Lords Cornwallis and Howe were among the distinguished patrons to visit the tavern. According to one version of the local legend, General George Washington, on his way to Princeton, stopped by the Terrill Tavern one morning. He found Mary Terrill outside doing chores. When she realized who was standing before her, she apologized for her appearance and offered to prepare breakfast for General Washington and his officers. He accepted her invitation and was served ham and eggs. The Terrill Tavern at its original location, early 1900s. The original portion of the tavern was moved by H. M. Searles to the rear of his residence on St. George Avenue opposite the original site prior to the 1940s and was used as a museum and reading room by the family. Mrs Searles was a descendant of Andrew Craig whose daughter Catherine was the mother of Abraham Terrill. 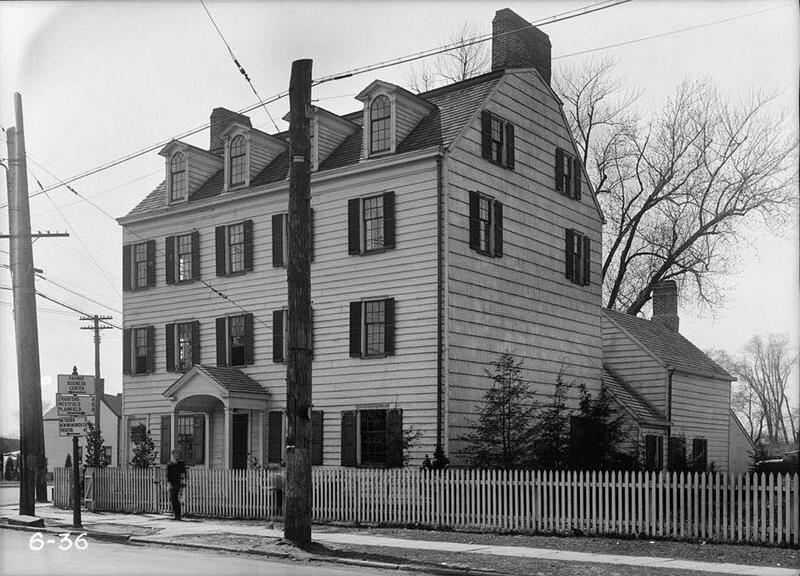 The Rahway Historical Society acquired the historic home in 1976 when the property it was on was sold and the historic tavern was due to be demolished. At its new location, it has been restored and now serves as the Merchants and Drovers Tavern gift shop. Just as rest stops allow travelers to use restrooms or grab a bite to eat today, taverns were their predecessor. Next time you are on the New Jersey Turnpike or Garden State Parkway, remember those before you who traveled by stagecoach on muddy roads, through varied conditions over the course of a day or two to reach their destination, which now only takes a few hours at most. Taverns such as the Merchants and Drovers were the original rest stops of this nation.